Gilda Jacobs, president of the Michigan League for Public Policy, was on a shuttle at Detroit Metro Airport last month when she found herself in the middle of a mini-focus group on Proposal 1. As she tells it, the shuttle hit a pothole, hard, and the driver apologized to the riders, saying that with a recent thaw, new hazards were appearing, and he told them to be careful as they drove home. “So I take the opportunity to say (to the other riders), ‘And this is why you need to vote yes on May 5,’” Jacobs said. No one agreed with her. “One guy said, ‘I would never do this’ because the legislature should have done their jobs and not put it to the voters. Another woman said something about heavy trucks.” And so on, ticking off the major voter complaints about the complex road-funding package facing voters on May 5. Jacobs, who supports Proposal 1, offered responses to each one: You can’t punish the legislature for this, only yourself and other drivers by rejecting the proposal; heavy trucks will in fact pay higher registration fees; the sales tax is fixed in the state Constitution, etc. Whether it did any good is anyone’s guess. Jacobs is voting yes for many reasons, but mainly because a constituency the Michigan League represents, lower-income families, would benefit from elements of the proposal. Brian Brown of Detroit will be voting no. He’s suspicious of the switch from a 19-cent-per-gallon gas tax to one based on a percentage of the wholesale price of fuel; it’s difficult to know how much more he’ll be paying. He doesn’t like the idea of raising a regressive tax like sales/use at a time when so many in the state have a hard time getting by. And ultimately, he doesn’t trust the party in Lansing that came up with this plan. Paul Mitchell is hardly a flaming liberal; he’s chairman of the Faith & Freedom Coalition of Michigan. Currently, he’s running the anti-Proposal 1 Coalition Against Higher Taxes and Special Interest Deals. But he doesn’t like the proposal, either. Mitchell doesn’t disagree that the state’s roads are in terrible condition and need to be repaired. But the legislative solution is overcomplicated, over-generous and overly burdensome to taxpayers, he said. Too many other constituencies – schools, municipalities, the state’s general fund – will see healthy gains from what is supposed to be a fix for the pavement, he said. Mitchell predicts a victory for his side, and when the legislature meets afterward – and despite claims that there’s “no Plan B,” he thinks there is, or will be – speculated that lawmakers will present a different solution, one that either finds the money elsewhere or raises taxes in such a way that no extras are provided for. And if they don’t, a citizens’ initiative would be his coalition’s next step – an unusual move in which the public writes a law and distributes it for signature approval, after which it is presented to the legislature for an up-or-down vote. Mitchell said he keeps hearing the phrase “hold your nose and vote yes.” He said he believes the roads can be fixed without nose-holding. 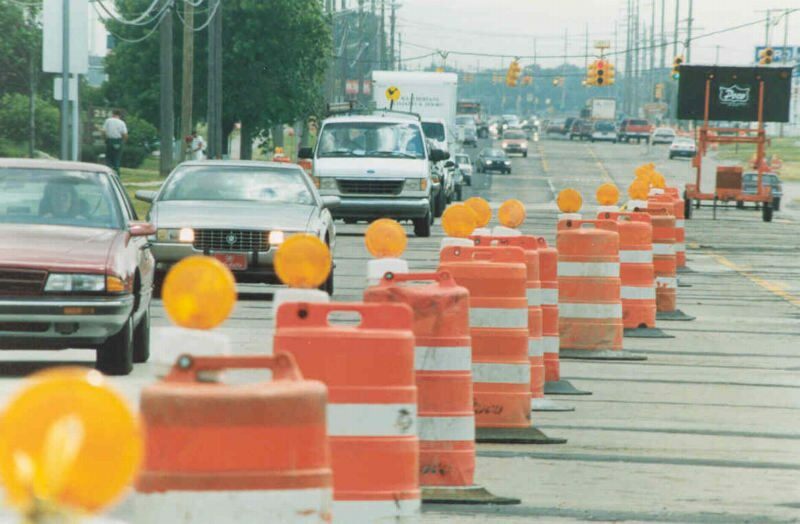 Who will do well under Proposal 1, besides Michigan’s roads? For constituencies like that of the Michigan League for Public Policy, the state Earned Income Tax Credit will be raised from 6 to 20 percent of the allowed federal amount, restoring it to the level it was before Gov. Rick Snyder’s first budget cut it to the smaller amount. The MLPP says that will mitigate the financial pain those families would feel from the higher gasoline and sales taxes the proposal would put in place. Using a variety of low-income household scenarios and estimates of how much gasoline they might buy in a year, the League pegs the cost savings to struggling families as anywhere from $177 to $608 per year. Jacobs said such mitigation is necessary because sales and gas taxes are considered regressive, i.e., they leave poorer families paying a larger share of their income. The most recent list of groups in the Safe Roads Yes coalition was 79 names long, and includes business and nonprofit groups, advocacy organizations, chambers of commerce, law enforcement, unions, environmental groups and others. The interests of some, like the Michigan Concrete Association and Michigan Education Association, are obvious – both road builders and schools also benefit under Proposal 1. Others have more oblique motivations. The Michigan Food and Beverage Association, for example, supports the measure in part because it includes members that transport goods via truck. Public transportation in Michigan will see a funding boost, because, under the state constitution, more money for roads means more money for mass transit. It is sorely needed, said Clark Harder, executive director of the Michigan Public Transit Association. “Demand is growing, but the systems are deteriorating,” Harder said. The state’s transit fleets are aging, he added, and nearly one-third of vehicles in the urban systems are at or beyond their recommended life span. Older buses cost more to maintain, so it’s driving overall costs up. And public transportation is rising in popularity, particularly with younger people, he said. Environmental groups are on board, mainly because of provisions for less-polluting public transit, and also because the Department of Natural Resources’ Recreation Improvement Account would receive about $20 million more if approved. That earmark is in place because owners of snowmobiles and off-road vehicles buy gasoline, too and, as with roads, a portion of the taxes collected are used to maintain the trails they travel on. The various groups opposing Proposal 1 have fewer recognizable names. Tea party organizations make up most of the roster, with some higher-profile politicians like Attorney General Bill Schuette, said Randall Thompson, executive director of the Coalition Against Higher Taxes and Special Interest Deals. But, he said, he believes their support is truly grassroots, based on thousands signing up for email and on Facebook. Perhaps the most conspicuous non-supporter is the Michigan Chamber of Commerce, which is remaining neutral, choosing to neither endorse nor oppose Proposal 1. Rich Studley, the state chamber president, said the decision was made because of a lack of a “high level of consensus” from members. Flint Mayor Dayne Walling agrees. I'm not totally against some kind of tax increase to fund road repairs but I have to vote no on this proposal, just too many things attached to it that I don't like. The legislature took a cowardly way out of dealing with the issue by putting it on a ballot, where is the leadership? just not there. I don't understand opposition based simply on the fact that more than one issue is addressed in the proposal. If you are opposed to additional school funding (there is no dispute that classroom funding has been reduced in recent years), or for municipalities, which have been shafted by the State of Michigan for the last 20 years or so, or if you don't think something should be done to mitigate the regressive nature of the sales tax by upping the Earned Income Tax Credit, then you might not like the add-ons and therefore oppose Prop 1. But to opposing it simply because it addresses more than one issue is not a good reason. It's a scam. These Republicans already slashed the Earned Income Tax Credit for poor working families. What's to keep them from doing it again? They've gutted education. What's to keep the right wing from doing it again? The only thing really guaranteed is the constitutional increase in the sales tax! More money for local governments? Not guaranteed. What's to keep the right wingers and reactionaries from cutting general fund money from our police and fire. They can cut education and money for municipalities from the general fund to give more tax cuts to the rich and corporations. That money is not in the constitutional amendment -- only raising the sales tax. They lie to their constituents about government getting too much money. When they stop lying to their voters, than I'll trust them. When the Chamber of Commerce takes back control of the Republican Party -- taking it back from the crazies -- we'll get the roads fixed. Because it's good for business. Vote NO! By voting no, you're only hurting yourself. The Legislature is not going to find another way to fund road improvement, as has been said over and over again by our Governor. More to the point, they really won't suffer any consequences if you vote no. But WE WILL. Consequences like more 100+ car pile ups, bridge collapses, and local tax hikes to pay for road repairs. So you either pay, or you pay. Either way, YOU PAY. Punish the Legislature when they're up for re-election by voting them out of office. There's your recourse. That's it. I'm a commissioner in Kentwood and oppose this tax increase; only a few of my fellow commissioners joined me. (We politicians are whores.) Problems not mentioned in the soporific boilerplate surrounding this tax increase include; Congress, the one in Washington, is close to passing law to help collect internet sales taxes. It will apply the tax at the rate in the sellers state. Internet sales will migrate to low tax rate states, and Michigan will lose whatever internet sales companies now present and forestall any new ones starting here. The tax will cost each man, woman and child in Michigan 200 per year; Kentwood will contribute 10 million, but we are promised 4 million (tops) back. Not a good deal. I did a 15 minute search of internet publications on what is presented to the citizens of nearby states about the state of their roads and infrastructure. Without exception I could find adjectives like the "worst roads" and costs of 3-500 dollars per car, the usual scary stuff. It's interesting that so many can collect under the usually unique superlative like "worst." thanks for the info on internet sales tax. do i understand that is from purchases people make on line - like amazon etc? isn't this tax supposed to replace the funds lost from corporation TPP that was voted on recently? In the financial world leveraging of assets is a common practice to raise capital. Capital is what the state needs to fix the roads. The state has several significant assets in Interstates 94 and 69 that are part of the NAFTA superhighway. This is a planned project for MDOT. Interstate 96 is another significant asset. The legislature must evaluate leasing these assets to a Public Private Partnership (PPP) to raise capital to fund a permanent and protected “capital fund” for necessary road repairs throughout the state. We need leaders in Lansing with experience in creating complex financial partnerships to propose legislation permitting the use of PPP’s in Michigan. Twenty-four states have enacted legislation to allow PPP’s. Michigan has not. In 2009 House Bill 4961 was introduced to authorize MDOT to enter into PPP’s. It failed for good reason. It was built on the old model of pledging future toll revenue against debt secured by bonds. Lansing must divorce itself from the outmoded model that taxation and bond debt is the only way to fund government transportation responsibilities. There should be legislative efforts to call for a thorough unbiased financial and economic evaluation conducted by independent analysts of road PPP’s implemented in other states and foreign countries. This analysis should include a comparative review of all current models of PPP’s. The Pew Center on the States has identified ten different models. The analysts should not be an extension of MDOT or the Governor’s administration. Why? This leads to administrative bias and “sealed container thinking.” A reason why Pennsylvania’s proposed PPP failed. The National Conference of State Legislatures has prepared a toolkit for state legislatures on PPP’s for Transportation. The Pew Center on the States has prepared an excellent “Do’s and Don’t’s" analysis for PPP’s based on a critical analysis of Pennsylvania’s failed efforts for a transportation PPP. Legislators and their staffs should review this material to understand the substantive benefits of PPP’s. They should validate their perceived negative aspects of PPP’s with facts based on analysis, not perceptions, rumors or heresay. If a legislator, a member of the administration or media can’t explain the legal and financial framework of the various PPP models, their criticism is “per se” illegitimate. Michigan should look to Indiana that raised 3.8 billion dollars with a PPP that covers 156.9 miles. Michigan’s road funding will not be resolved until we have creative financial leadership in Lansing. It will not be resolved by raising and / or shifting tax revenue or by dealing for votes to increase taxes by sharing the tax bounty with special interest groups that are unrelated to transportation needs. The use of creative financing based on private investment alleviates the need for federal funding. As a result “prevailing wage laws” required by the Davis Bacon Act can be avoided. Tolls and fees collected by a PPP is taxable income to the private investors thereby generating available tax revenue to the state. Michigan's prevailing wage law must also be repealed. Voters must reject the proposal. This is a mandatory “do over” for Lansing. Jim Fuscaldo: So, what you're really saying is that we should build Toll Roads. Vehicles that use the roads pay for their upkeep, right? Great for the interstate system, but how about county roads? And why do you choose to ignore I-75? Don't you consider that an asset like the other interstate roads you mention? Oh, and you don't want to pay union scale to the people who build the roads? I didn't realize that there were a plethora of non-union road builders available. You do raise a legitimate question about alternate sources of highway maintenance funding though. Consideration of Interstates 94 and 69 and possibly 96 are a starting / discussion point. Especially 94 and 69 which are part of the proposed NAFTA superhighway and eventually will be a toll road like it or not. Depending on the nature and construction of the PPP the state will get an up front cash payment (Indiana model) and /or royalty payments to be calculated and negotiated with the PPP. This cash payment must serve as a restricted capital fund for allocation by the state to fix ALL roads (county roads etc.) and other roads NOT part of the PPP. The PPP will have responsibility for maintaining the interstate/road included in the PPP. A key element of the capital fund is this, IT MUST BE RESTRICTED BY LAW to fund only roads not high speed rail, bike / walking paths, international crossings or to subsidize other forms of mass transit. It must NOT be available for use via lending/ borrowing by the state for other state needs (state employe retirement funds). Unused capital funds held in reserve could be invested for income growth to grow the funds in reserve. In short there are many ways to leverage assets via a PPP. What's the harm in having a discussion about alternatives other than tax, redistribute and spend? Yes, there are a variety of international financial conglomerates that have invested in PPPs throughout the world. It is called "globalization". However, the legislature and the governor have to get off their tax and spend "asses" and consider legislation that would permit PPP's in Michigan. Creativity is the mother of invention and solutions. an interstate highway cannot be converted to a toll road, it's against federal law. Pennsylvania tried to get an exemption and it failed. If an interstate road was originally constructed as a toll road and funded accordingly that is an exemption. Public private paternerships have some value but it is limited to a few situations such as the new bridge to Canada where tolls will pay for the investment. PPP's do no good for for Michigan interstate roads and certainly no value for all other county and city roads and bridges. an interstate highway cannot be converted to a toll road, it's against federal law. Pennsylvania tried to get an exemption and it failed. If an interstate road was originally constructed as a toll road and funded accordingly that is an exemption. Public private paternerships have some value but it is limited to a few situations such as the new bridge to Canada where tolls will pay for the investment. PPP's do no good for Michigan interstate roads and certainly no value for all other county and city roads and bridges. Substantiate your claim that it is against Federal Law by citing the relevant Federal Statute and or case law. Jim, you have obviously put some effort into your message. How about doing just a little bit more thinking? You are suggesting "creative financing." Do the names "Bear Stearns". "Lehman Brothers. ", and "Countrywide Financial" ring any bells for you? Creative financing tools magically invented out of thin air were what very nearly brought down the entire global economy and caused trillions of dollars of people's net worth to evaporate practically overnight. Don't take my word for it, however. I can recommend a book, "The Colossal Failure Of Common Sense" by Lawrence G. McDonald and Patrick Robinson (2009). The only way I could ever endorse a program of "creative financing" for anything would be if the principals and their agents would sign ironclad agreements ahead of time to divest themselves of all their assets and immediately turn themselves in for voluntary imprisonment should their creative schemes go south. The usual legislative process can be ugly, but I would rather trust people who can be voted out of office or forced to resign their posts in the event that their pretty promises turn out to be quite hollow. Twenty-nine states and Puerto Rico have enacted authority for a state transportation agency to consider and enter into PPPs for highway projects; 20 states also allow transit PPPs. More than 80 transportation PPPs have been completed over 20 years in the states (this includes all design-build projects and a handful of transit and airport projects), involving more than $46 billion in investment. PPPs also have been used to procure other types of infrastructure, including schools, housing and water projects. If Proposal 1 fails what is the harm in having a debate about using the PPP model as an alternative to fund Michigan roads? Toll roads are a hugely inefficient way to increase revenue. All the overhead and upfront money to create a toll road that doesn't need to be spent in he first place if we simply pay the tax rate we should. Voting 'yes' because the alternative is all smoke and mirrors, like toll roads and pie in the sky new sources of revenue or increased revenue because of certain projections that never get us anywhere. This appears to mean creating a network of toll roads which will profit someone; not necessarily us. isn't the indiana toll road owned by a company owned by Spain and Australia? "Leased" The Indiana Toll Road was leased to foreign investors. The first one, in Spain went bankrupt and the lease was acquired by a company in Australia. Rates have gone up at least 50%, people have been laid off, Gov. Mitch Daniels got a nice (non-toll) freeway around Indianapolis and lots of good money is going overseas. If southern Indiana wanted to steal the money for northern Indiana's tollroad they could have revised the original charter for the road, raised tolls, etc. all while keeping the money within the state. It seems to me the 3.8 billion dollars Indiana received for the lease stayed in the state. The income (tolls) received by the "foreign" lessee/investor is also taxable income. The employee costs of maintaining the leased roads is transferred from the state (no state liability/future debt) to the lessee either directly, or indirectly by being absorbed by the lessee's subcontractors. It is not the state's function to create jobs, but to provide an environment within the state to attract private enterprise that will create opportunities for jobs within the state. "NATFA superhighway" is code for wingnut conspiracy theory. If the NAFTA SUPERHIGHWAY is wing nut conspiracy then why is it on MDOT's transportation agenda, and why is there such interest in the International Crossing which is part of the plan to connect the U.S. with Canada up to the deep water ports in Halifax? PPPs as you state are long term giveaways of public dollars and control to private interests. They should all be eliminated, as should your rhetoric. This would be great. Seriously, I genuinely like this idea. There's just one problem - the Legislature has already considered such proposals and has been unable to move any related legislation forward. They can't come to a consensus. They just aren't going to do it. And while it would be nice to force them back to the drawing board (kind of like sweet, sweet revenge), we're WAY beyond the point where that's a realistic option. In the end, they'll likely spend years more debating this. Meanwhile, the roads will continue to deteriorate, the cost of fixing them will skyrocket, and more people will die needlessly in accidents directly attributable to poor road maintenance. Just vote yes and get it over with. Then encourage the government to go with this plan, allowing them to lower the taxes again. I don't understand why so many of you people in the opposition can't see this as a viable choice. A tax hike can be undone later. But we need better roads right now. The legislature failed the citizens it ran to represent. Cowards!! Excuse Makers. They knew about these problems at least for past four years. If we are going to have to vote on every issue the legislature/gov. will not. Then it's time to recall Gov. and make legislature a part-time legislature. Just fix the roads! Mass transit anywhere north of SE MI is a total waste of good money. And SE MI? Charge the users of it and not me in Traverse City or Mackinaw or Ironwood so that some people mover in Detoilet can carry no one to nowhere. Schools? Separate issue! So, separate vote. And since no plan B? What in the world are we paying the clowns in Lansing for? Send then home, all of them and only allow them back "Part time". Maybe some would have to get a real job? VOTE NO!!! We're already subsidizing the north, not the reverse. Northern LP and UP get much, much more per capita than Detroit--and with your wages, you aren't contributing more than Detroiters. I agree and stipulate to the idea that our roads and bridges are in terrible condition, and getting worse with the passing of each season (not just winter). But I am against this Proposal for the following reasons: 1. The current and past two governors, representing both parties, have each indicated there is a problem. This is not new, just getting worse; 2. The past two governors (again representing both parties) have each cited an expense of $ 1 B + to bring our roads and bridges up to snuff....yet this Proposal amounts to $ 1.9 B + in perpetuity, not just until the roads are fixed. (So is that kind of money required to keep-up the roads? B.S. ! ); 3. All the "add-on" legislative initiatives are a fairly obvious indication that funding for roads currently in existence, will be "back-doored" out of the road repair issue, and into some "black-hole" of waste / special interest projects, as soon as this initiative were to pass; 4. Everybody, and I mean everybody in municipal government, and Regional Planning Agencies, already know that when M-DOT receives State or Federal funding for anything, 50% plus, is automatically deducted for so-called "administrative fees". Nobody is exactly sure what those administrative fees pay for? But, it is one primary reason why Congress considers Michigan a donor State....MDOT and 3 other major Departments of the State don't give Congress any "bang-for-their buck"! ; 5. Has anyone looked at any of the causes of the problems with our roads? How about heavier-than-the-other (at least 47) state's truck GVW's? How about substandard road [building] materials? (Or is I-275 having to be repaved 11 times in the past 23 years just a fluke?) How about poor designs for things like bridge crossing seams, and drainage troughs at curb-cuts? These M-DOT "brain-childs, all but guarentee pot-holes within 5 seasons !!! So, maybe we need a new funding source for this problem....but lets put a sunset date on any tax increase, that is reasonable to get the job done....say 5 years, and if the job isn't done, then we start replacing state officials in that department....no golden parachute, no residual benefits, they didn't perform, get rid of them and lets start again, until we get it right. When I listen to the supporters and the detractors, the biggest disconnect I hear is that they don't agree on the meaning of the word, "guarantee". Proponents think that means a statutory promise, even though future legislatures can change it, while opponents think those promises need to be in the constitution (as the tax increase is) in order to have any cache. Ear marking doesn't work anyhow because the rest of the budget can be altered. I'm sick of hearing people whine about lottery funds, when they do go to K-12 education. It's just that the lottery revenues are a really small fraction of what the state spends on K-12 education. Of those I know who are voting 'yes', including myself, none of us believe anything is guaranteed--except failing to pass it means more of the same decline conservatives have been advocating, soon to rank us between Mississippi and Mexico in more quality of life categories than you thought existed. I understand it takes money to get this done, but I am against it wholeheartedly. This proposal does not do it equitably. The little old lady driving her Buick - is not the reason the roads are in such bad shape. We have the highest GVW allowed on our roads in the United States. For a proposal that is widely hated by the public the vote yes people seem to be putting up just a half hearted effort, the TV ads are lame and unconvincing and they seem to be missing in the early morning when people are watching local news, what is the strategy? I get the feeling that they realize this is a lost cause and are just going through the motions. The vote no people haven't even started advertising yet (that I have noticed). In the past, road repair was funded using existing taxes. Where have those tax dollars gone? I think the reality is that there is plenty of money to fix the roads but not enough money to bail out Detroit. I suspect that most of the sales tax increase will end up being used to fix Detroit roads, fund intercity school programs for black youth and general welfare payments. If the people allow the state to raise taxes now, what will happen in ten years when the roads fall into disrepair because all the money is spent on social programs? Will they then propose ANOTHER one percent increase in the state sales tax? The politicians want the money and put those ads on TV showing people with damaged windshields and telling tales of near disaster. What a load of bull. Any politician, police officer or municipal official who believed that a road was a hazard to motorists would instantly close the road. None of them wants to be held accountable for some persons injury when they could have prevented it. As for "no plan B" that's bull too. Your elected officials are there to SERVE you, not threaten you. How dare they say there's no money for roads when there's unlimited cash for welfare. Hogwash. Welfare was virtually eliminated by Engler. I am totally against any tax increase.we need accountability for tax money we are already paying.I see roads in other states being resurfaced why can't michigan do the same? If we keep bleeding the people of this state they're gonna move elsewhere.Im also further against any uncapped tax with no guarantee where the funds will go. Also if we're dealing with infrastructure let's keep it that. The state legislature won't address the issue of heavy trucks. Well over 90% of the damage to roads is caused by heavy trucks. Of course the freeze thaw cycle doesn't help, but there are other northern states that have far better roads than Michigan. They also have a lower weight limit on trucks. The truckers don't pay for the damage--Michigan has one of the lowest diesel fuel taxes in the country. To use a military metaphor, stop the bleeding before dressing the wound. Michigan citizens can vote to raise their taxes to fix the roads. The proposal, however, does little or nothing to address the cause of Michigan's bad roads--heavy trucks. Thus, even if taxes are spent to fix the roads, they'll soon be damaged again. I'll vote YES when the pension tax is repealed. Otherwise, NO on Proposal 1.